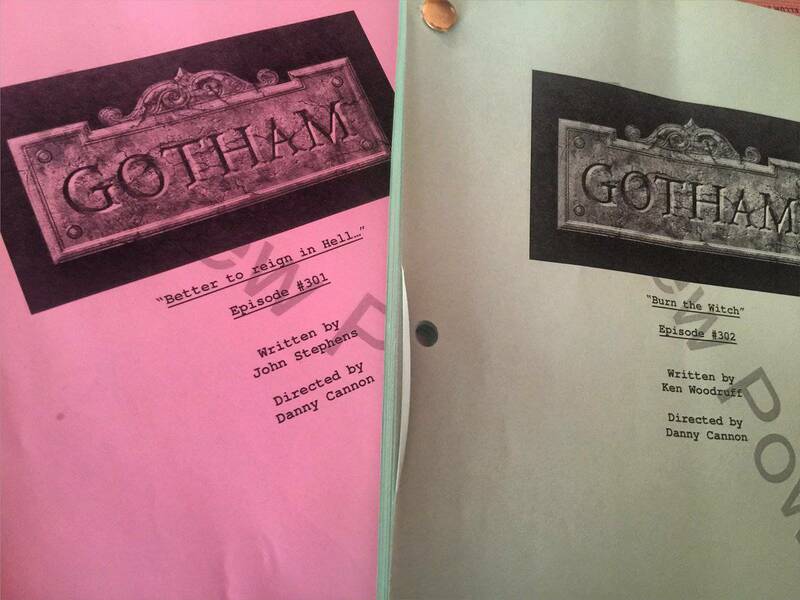 Drew Powell, the talented actor who portrays Butch Gilzean in Gotham, tweeted an image of the first two scripts for the upcoming season. The Season 3 premiere is titled "Better to reign in Hell..." and was written by Executive Producer John Stephens, who previously wrote six episodes of Gotham. Episode two is titled "Burn the Witch" and was written by Ken Woodruff, who previously wrote seven episodes of Gotham. Both episodes are being directed by Danny Cannon, who previously directed four episodes of Gotham, including the pilot. On Season Three of Gotham, the origin story continues and the stakes are higher than ever, as Super-Villains more ambitious and depraved are introduced, and a realignment of alliances shakes up the fight for power in Gotham City. Cast: Ben McKenzie as Detective James Gordon, Donal Logue as Harvey Bullock, Michael Chiklis as Detective Nathaniel Barnes, Sean Pertwee as Alfred, Robin Lord Taylor as Oswald Cobblepot/The Penguin, Erin Richards as Barbara Kean, David Mazouz as Bruce Wayne, Camren Bicondova as Selina Kyle/the future Catwoman, Cory Michael Smith as Edward Nygma/the future Riddler, James Frain as Theo Galavan, Jessica Lucas as Tabitha Galavan, Chris Chalk as Lucius Fox, and Nicholas D'Agosto as Harvey Dent. Season 3 of Gotham will premiere on Monday, September 19th at 8:00-9:00 PM ET/PT.